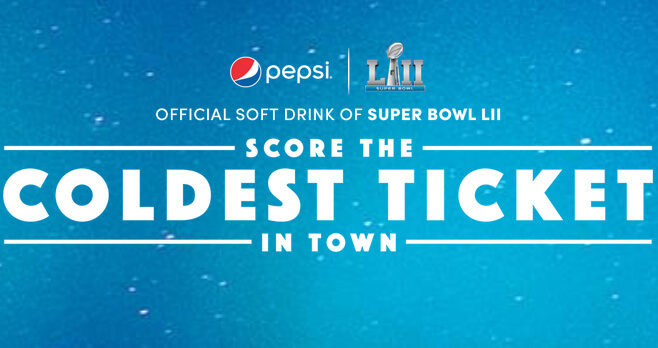 Pepsi, official soft drink of Super Bowl LII, is giving football fans the chance to score the coldest ticket in town. Go to SB52Pepsi.com or text SB52 to 88500 and enter the Pepsi Super Bowl LII Sweepstakes 2018 for a chance to win a trip to Super Bowl 52 on Sunday, February 4, 2018.
Who Can Enter? The Pepsi Super Bowl LII Sweepstakes 2018 is open to legal residents of the United States, residing in Alabama, Arizona, Florida, Illinois, Indiana, Iowa, Kansas, Louisiana, Maryland, Michigan, Minnesota, Missouri, Mississippi, Nebraska, North Dakota, Oklahoma, South Dakota Tennessee, Texas or Wisconsin, who are 18 years or older (19 in AL and NE). When To Enter? Sweepstakes begins at 12:00 a.m. CT on December 4, 2017 and ends at 11:59 p.m. CT on February 4, 2018. What Is The Super Bowl LII Sweepstakes Prize? The Grand Prize consists of a trip for two (2) to Super Bowl 52 on Sunday, February 4, 2018.
Who Are The Pepsi Sweepstakes Winners? For the names of the Super Bowl ticket winners, send a self-addressed, stamped envelope, postmarked by 3/1/18 to “2018 Pepsi SB52 Sweepstakes” Winners’ List c/o PSG, PO Box 941459, Maitland, FL 32794-0340.